The University of Louisville Athletic Department started its “Coming Full Circle” capital campaign to fund the expansion of Papa John’s Cardinal Stadium. Funds raised will add 10,000 seats to the north end of the stadium and the Howard Schnellengberger Football Complex will undergo major renovations. The $55 million project will include 1,000 club seats, 70 premium boxes and 12 exclusive field level suites. Jurich said construction for the expansion would take up to two years, and the project should be completed by 2019, when Louisville hosts Notre Dame in the season opener. 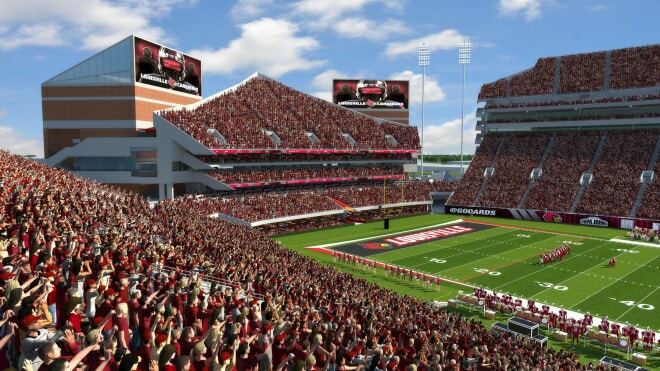 Though 2019 is the target date, Jurich would like for the stadium to be completed as soon as possible, but it depends on fundraising. Fans will be closer to the field than ever before, with field level vantage points that will improve the game-day atmosphere. Student-athletes will benefit from the team’s weight room and conditioning center doubling in size. 70,000 square feet will be added to the training areas while improvements will be made to the coaches’ offices and players lounge. PepsiCo donated $5 million for naming rights on the club expansion while Planet Fitness has given $3 million for the expansion of the Howard Schnellenberger Football Complex. Papa John’s Cardinal Stadium was originally completed in 1998, and expanded in 2010 to the capacity of 55,000. After construction is complete, the stadium will approximately hold 65,000.